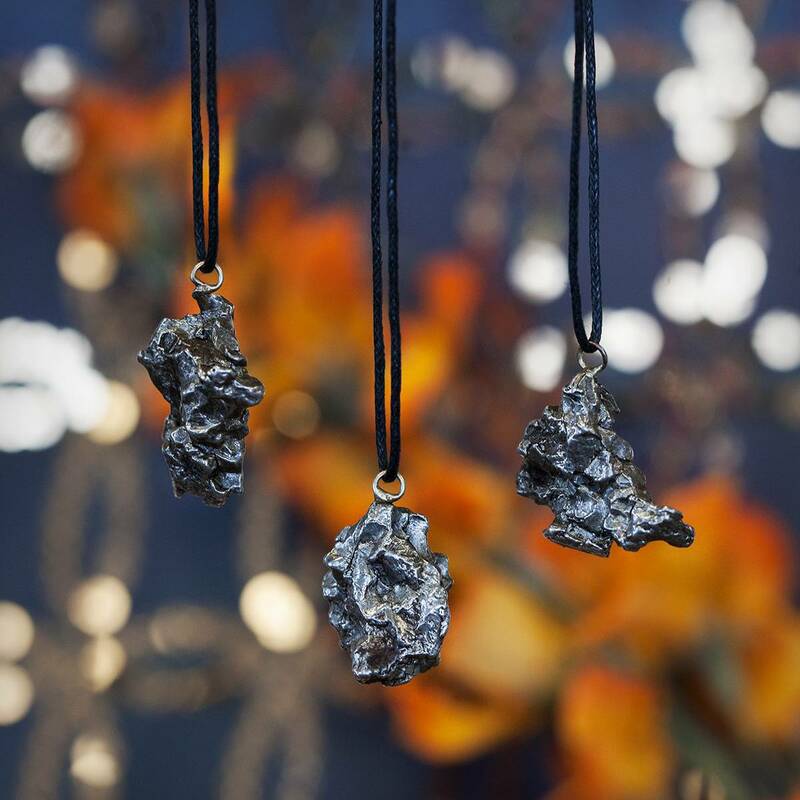 These Campo del Cielo meteorite pendants trigger such a strong physical reaction in almost anyone who touches them. And these rare specimens are the real deal. They are authentic pieces that were mined in Argentina, where this meteorite crashed. The indigenous people tell the story of it falling from the sky in a place they called Piguem Nonralta, which translates as Campo del Cielo, or “Field of the Sky”. When the Spanish were colonizing South America in the 1500’s they discovered this ancient, extraterrestrial mass of metal. The Spanish assumed it was a silver and brought back samples which were described as being of unusual purity. It was eventually forgotten until 1774 when Bartolome Francisco de Maguna followed the legends and rediscovered it. Maguna dubbed it el Meson de Fierro, or “the Table of Iron” because he believed it was the tip of an iron vein. There it sat until 1783 when another expedition used explosives to clear the ground around it, and they discovered that it was actually a single mass. Samples were then sent to the Royal Society of London where it was finally acknowledged as having meteoritic origins. The Campo del Cielo fragments found so far exceed 60 tons, making this the heaviest meteorite ever discovered on Earth. I’ve known people who refuse to touch meteorite fragments because their properties are so strong and otherworldly. There are even some energy healers who refuse to work with meteorite because it is believed that it carries alien energies which can never be cleared. True, as the meteorite entered our atmosphere, it carried foreign energy with it; what exact energetic power this stone possesses remains a mystery. I will say this: It is not a beginner stone. This is some serious, next-level magic. If you feel drawn to bring this stone into your collection and into your practice, be prepared for its strong vibration. These pieces are small but mighty. Most people I’ve met who say they’re not sensitive to stones feel something with this meteorite. Based on what we do know about this alien gem, I can tell you that it deepens psychic abilities, opens the Third Eye, and facilitates access to the Akashic records. Get ready to catapult your spiritual evolution. This listing is for one (1) Campo del Cielo meteorite pendant (about 0.75-1” in size). Yours will come to you lovingly parceled and ready for wearing, along with a card describing the stone’s properties.